Could the shutdown end today? FAA issues could end it as early as today. WASHINGTON (AP) — Intensifying delays at the nation’s airports and widespread disruptions across the federal government instilled new urgency Friday into efforts by President Donald Trump and Congress to bring a resolution to the 35-day partial shutdown. Trump and the Democrats in Congress remained at odds over his demand that any compromise include money for his coveted border wall. Senators were talking with increased urgency after Thursday’s defeat of competing proposals from Trump and the Democrats. The bipartisan talks provided a glimmer of hope that some agreement could be reached to temporarily halt the longest-ever closure of federal agencies. Trump says any short-term deal to end the shutdown must include a large down-payment for a border wall — an idea Pelosi and Schumer immediately rejected. Meanwhile, the toll of the shutdown was being felt at airports across the countries. The Federal Aviation Administration on Friday reported delays in air travel because of a “slight increase in sick leave” at two East Coast air traffic control facilities. White House spokeswoman Sarah Sanders said Trump has been briefed on the airport delays and was monitoring the situation. At the White House Thursday, Trump told reporters he’d support “a reasonable agreement” to reopen the government. He suggested he’d also want a “prorated down payment” for his long-sought border wall with Mexico but didn’t describe the term. He said he has “other alternatives” for getting wall funding, an apparent reference to his disputed claim that he could declare a national emergency and fund the wall’s construction using other programs in the federal budget. On Friday, White House Press Secretary Sarah Sanders didn’t offer much clarity. “At least we’re talking about it. 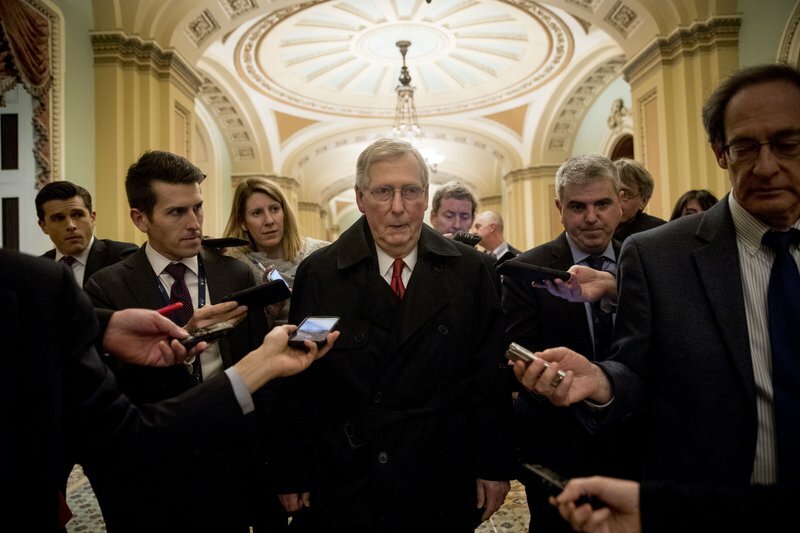 That’s better than it was before,” McConnell told reporters in one of the most encouraging statements heard since the shutdown began Dec. 22. McConnell spokesman Don Stewart said Friday that it is still up for Pelosi and Trump to take the lead, even as a clamor is growing in the Senate for McConnell and Schumer to grab the reins.